E-Maculation :: Error compiling sheep_net.ko and it doesn't work. No, the Raspberry Pi 3 onboard wifi driver definitely doesn't support monitor/promiscuous mode. 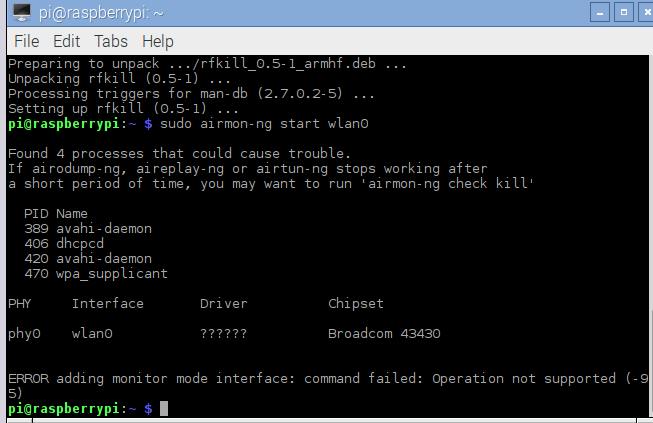 Doesn't use the calls, pcap_set_rfmon() and pcap_set_promisc() that enable monitor/promiscuous modes. Sniffing packet on the network interface doesn't required to enable promiscuous mode on network interface. They are two different things. The IP packet sent to/received from host OS network interface by sheep_net shares the same host OS NIC physical MAC address. The only difference is in IP address. You don't need to enable promiscuous mode. I don't have any good recommendation to debug it further since wireshark seems to affect the outcome. Unless you want to debug this on Basilisk II side, otherwise be a happy ignorant and enjoy your gadget! before and see if there is anything significant in the messages. So I set DEBUG 1 and recompiled Basilisk. For each test I pinged 5 times to 192.168.1.1 then shut down. Sorry to miss your thread. It is hard for me to debug since I can't replicate your environment. If you are experienced in docker container or vagrant, how about we build BII in virtual env so that we have the same base line to start with? I suspect the problem might related to your OS or network settings. By using virtual stuff, we can eliminate the OS difference. Then we only focus on networking.